With graceful curves, modern sensibility and functional appeal, the Cally collection provides an updated take on classic farmhouse style. Crafted entirely from solid pine, rough-hewn planks bear the characteristic saw marks, dents, pits, and random knots of freshly-milled timber. 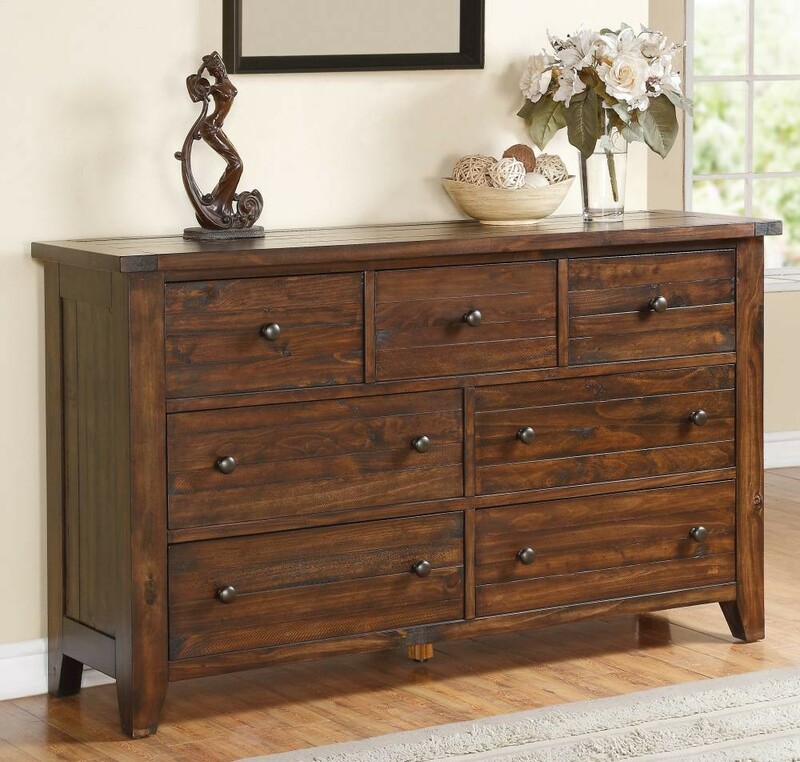 A rugged yet refined Antique Mocha finish uses a rustic glaze to simulate the patina of weathered lumber and a lacquer top coat to showcase the rich natural character of the wood. – Built from solid Pine. – Full-extension ball bearing drawer glides. – Solid wood drawer boxes constructed using English dovetail joinery are sanded and smoothed to match the exterior finish. – Cross-banded breadboard top panels. The Abigail platform bed, covered in an attractive tan linen-look fabric, features design details including individual nail-head accents. The Abigail bed kit includes a screw-in slat roll, bolt-on rails for added stability (not hooks), center support on slats and wood feet. The Abigail headboard is also sold separately. Available in Queen 5/0, Eastern King 6/6 and Cal King 6/0 sizes only. The centerpiece of any bedroom, the Colton platform bed from Emerald Home will help take your style from simple to sophisticated. The crown cap silhouette and neutral-toned upholstery give this must-have platform bed a warmth while the nailhead trim adds sophistication. Transition your bedroom into the retreat you deserve with the Colton platform bed.